Can’t go wrong with a sleeping puppy picture, right? Thanks for stopping by my blog. Have a great day! Awwww – such a sweet puppy!! She really is. I have a lot of pictures of her sleeping! Thanks for following, Janine. Hana is an Alaskan Husky / Eurohound mix. She’s very fast when she’s not sleeping! Is there any love purer than that from a dog? Great photo! I don’t think so, Ilene. It’s hard to be sad about anything with a puppy around! thedoseofreality recently posted..LEGO My Toys! I have to say, she’s pretty lucky she’s cute sometimes. She ate part of the living room rug today! Beautiful! I love the processing. Is this puppy a yellow lab? 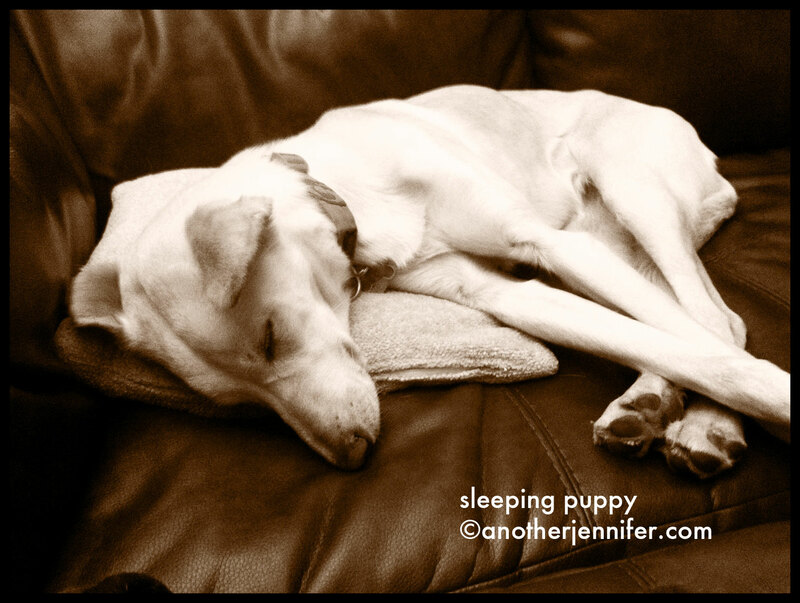 I ask because I have a yellow lab and got him when he was a puppy and OMG…he is a bundle of energy – STILL, six years later. Hehe. She’s an Alaskan Husky / Eurohound mix, which means she’s a racing sled dog. See those long legs? She’s wicked fast and can jump very high. When she’s not sleeping, she’s running around at about 130 miles per hour! Wow. Thanks! Oh and I forgot to mention that I took the photo on my iPhone and edited it a bit using Camera+. I find my best photos come from my phone! She loves pillows. It’s very funny. She always takes the most comfy spots on the couch! Seriously. I’d love to lounge as much as she does! I love when dogs sleep with their legs crossed. I try to take pictures of mine but he’s black and my couch is black so I can never get a good shot. Haha. That’s too funny. Her legs are so long, they always ended up crossed in some way. Sometimes we joke that they look like they are braided. Nothing more peaceful than a sleeping puppy. LOVE IT. TAM recently posted..My life as a Harfockian…. Awe, Jennifer. That’s so adorable. My dog (a Boston Terrier) actually curls herself up into a ball like a cat. Thanks for joining us at Wordless Wednesday Bloggers! That’s where I want to be right now. They’re always adorable when they sleep, aren’t they? Kind of like babies! You can never go wrong with puppy pictures, Chris!